Well, it's already created, you can just order one!When the city becomes too hot in the summer, we all want to escape! Somewhere on the beach, up on the mountains, at the cottage or just camping. Here’s a very interesting idea of a portable shabby chic room with a view and not just any view but a 360 degrees. 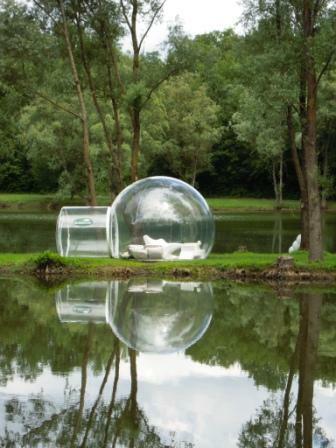 And apparently it only takes 15 minutes of inflation time to be able to cocoon inside your transparent balloon. 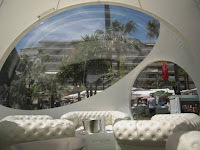 The sphere which does not require reinforcement consists of two half spheres in a transparent, opaque and white. 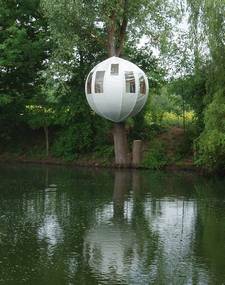 When Pierre decided to follow his ecological dream the result was the company BubbleTree, which is basically a tree hut, a platform you create and install to create your own tree house. Then he came up with the idea of CristalBubble which is made of recyclable, anti-UV, crystal – clear material that can be placed anywhere. The entrance is supported by a light weight frame and creates a barrier between outside and inside. A blower ensures that air renewal is continuous and humidity, mosquitos and other pests are kept out. 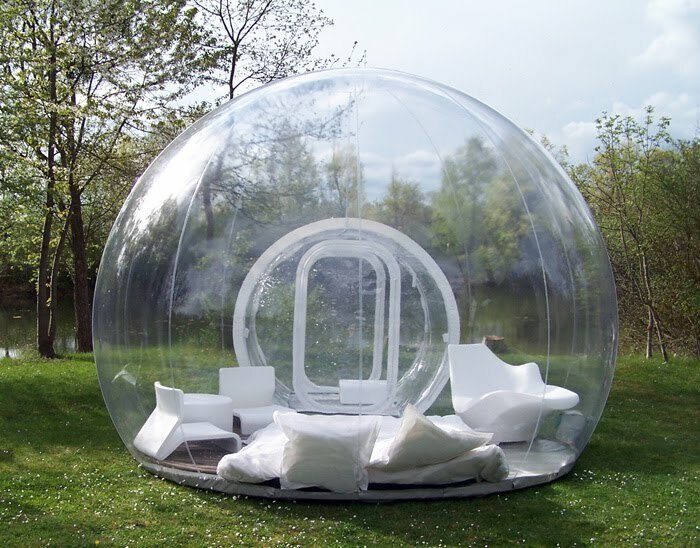 If more privacy is desired, you can use the opaque BubbleRoom and if you need more space you can look into the BubbleLodge which combines several modules. 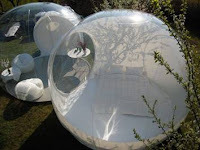 This is more than just five stars camping, it’s ecological and seems to be extremely comfortable not to mention how inspiring it must be to be surrounded by nature inside this magnificent spherical interior space. Want to know how much it costs to have your own bubble tree? It's become so popular! During the film festival in Cannes Rent your private space in the garden of the Grand Hotel! For more images and ideas click here.